I’ve mentioned my super sniffer here when I showed you all how to get smells out of wooden cutting boards, and today I’m sharing another stinky spot in your kitchen: the smelly sink drain. Have you ever smelled something in your kitchen and not quite been able to figure out where it’s coming from? 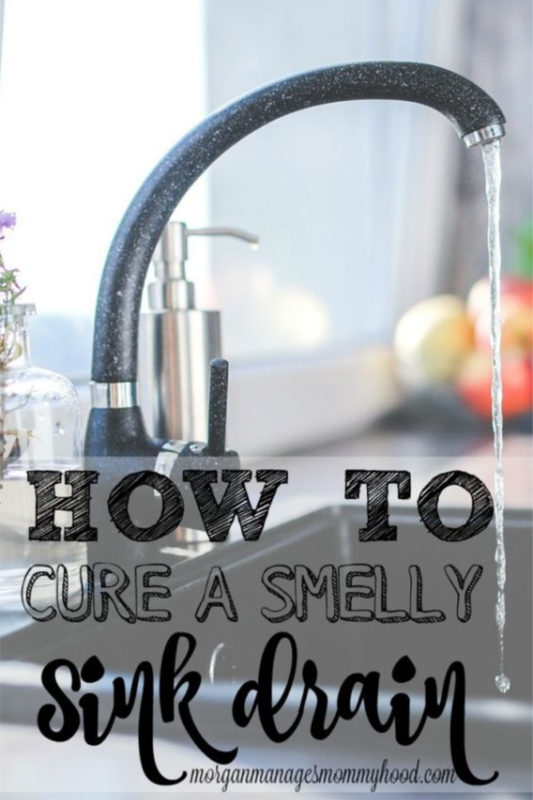 Take a big whiff of your sink – yup, it could definitely be coming from there – you need my remedy for smelly drains. You only need 2 ingredients for this remedy for smelly drains – get rid of your smelly sink drain! Sometimes, food and grease gets stuck in your sink. It can slow down the water draining from your sink and gives you a smelly sink drain that stinks up your whole kitchen. Unless you have the perfect drain catch and never ever put any type of grease or oil into your sink (teach me your ways!!) at least once you’ll occasionally have stinky sinks. So what is the remedy for smelly drains? Keep reading to find out how to take care of that smell and do it without any harsh chemical cleaners. Be sure to check out my cleaning tips page to find more awesome tips and tricks! Start with a clean, empty sink. Boil about 2 quarts of water. Once boiled, flush the drain by pouring the hot water down the drain all at once. (Please be careful. Do not dump the hot water in a way that it will splash and burn you.) This will melt and soften any grease that’s trapped. Flush with the boiling water or run hot water for 1-2 minutes and allow to drain out. Rinse any leftover baking soda down with the hot water. To finish, flush with COLD water from the sink for 1-2 minutes. And that’s it! Enjoy your non-smelly sink drain! Have you ever had a smelly sink drain before? How did you fix it? Let me know in the comments! Thanks for the tips, I can definitely use them. Smell drains get on my nerves. Great tip, Morgan! I use this method all the time. 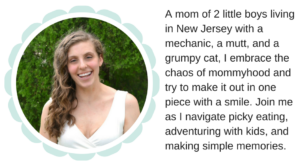 And by the way, I love your tagline…”learning to be a mom one day at a time.” I’m an old mom, and I’ve been at this a long time, but that is still how it goes! 😉 Stopping by from Mommy Moments! This is a great tip. Thanks for sharing. Have a wonderful day! Some great tips here, especially reading about getting smell out of cutting board. This is one of my favorite tricks. It works! And it’s fun…like those volcano science projects when we were kids. 🙂 Thanks for sharing on the Small Victories Sunday Linkup! Thanks I really needed this tip! There’s a terrible smell in my kitchen sink, I have one of those,ugh I can’t think of the name right now, one of those sink chopping things light the switch under the sink, you know what I’m talking about, right! Every time I go to do the dishes the smell just punches me right on my nose. I like that your method is green, no harsh chemicals involved! Hahha it’s cool, I totally get what you’re saying – a garbage disposal? For that, I’d also add some lemon peels or other citrus right down into the sink and the grind it when you’re flushing with the initial hot water – my dad had one when we were growing up and every time it stunk that’s what he did! Yes garbage disposal (#mommybrain), awesome, thanks for the extra tip! You are right on time with this one! That smell is driving me crazy, thank you so much. Great tip, Morgan! I run a household full of boys. I know how yucky the sink drain can get. I do this too, but probably not as often as I should. Any tips on how often I should be doing this? I also will only use vinegar, I read somewhere that if you use baking soda and vinegar together, their cleaning power won’t work right. Have you ever heard anything about this? It was nice reading your sink tip( I should probably look it up,lol.). Have a great weekend, Morgan. Hi, I’m visiting from Wow Me Wednesdays. What a great idea. I have used the baking soda and vinegar before but never thought to pour the boiling water in first to soften the grease. That makes a lot of sense. I’m going to have to give it a try. Have a great day, Kelly. I find the smell ususally is coming from the garbage disposal and lemons were always the way to get it out. I like this tip and although I have a brand new sink and pipes from my kitchen redo, will be tucking this tip away for future use. Thanks for sharing at my party this week. Great tip! Why do mom’s get blessed with a super sensitive nose? I’m right there with you on those bad smells. Love using natural cleaners btw! It is a common problem that people can face in their kitchen so I hope your fantastic tips can help them to get rid of it. Thanks for sharing! I’ll have to try this technique. I’ve heard of using baking soda and vinegar to clean out drains, but I didn’t think to run hot water before and after and to finish with cold water. An addition I would recommend is to put a lemon through the garbage disposal. It’ll give your sink a nice, clean smell. Thanks for the tips! I will definitely try this technique. Also, my brother who is a Plummer says not to use lemons 🍋 for your disposal as it will plug up. What he says to use is ice cubes. Fill your drain w/disposal up with ice cubes then turn on your water and flip the switch to turn on the disposal. The ice will act as glass and scrape it all away.